So the infamous question, where did they all come from? Well as local lore goes, the hurricanes of 1982 (Iwa) and 1992 (Iniki) destroyed domestic coops, releasing the chickens into the jungles. 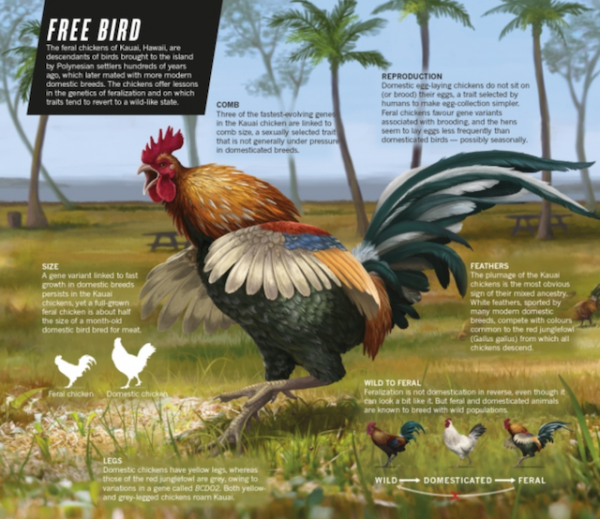 These domesticated birds then mated with the wild red junglefowl (brought to the islands by the Polynesian) resulting in the feral chickens we see today. Having no natural predator, except for the occasional cat and dog, these fowls are populating at an alarming rate. And while tourists visually find them amusing and love to lure them closer with food for the perfect photo, they can be a nuisance both audibly and physically. As a vacation rental company, you can only imagine the amount of calls we get from disgruntled guests regarding their resident crowing rooster. Understandably so, as nobody wants to be woken up unwillingly at 4:30am on their vacation! Unfortunately, short of attempting to catch and relocate the rooster (they are territorial), there isn’t much we can do about it. It is unclear as to what their effect is on our ecosystem. “Before deciding how important it is conserve them, manage them, or cull them, it would be good to at least know about their impact,” says Eben Gering, an evolutionary ecologist. Most residents would offer a ‘no big deal’ response to their presence, but some local farmers feel differently. They find that the rooting and scratching of the chickens kills their trees and wreaks havoc on their gardens. And let us not forget, of course, that they so pleasurably feast upon the dreaded centipede, minimizing the population of that creepy chilopod. I think it is safe to say that our relationships with these chickens are complicated. But regardless, they are here to stay and have become a part of our island culture, and just as they have, we must learn to adapt to their presence. Whether we like it or not.